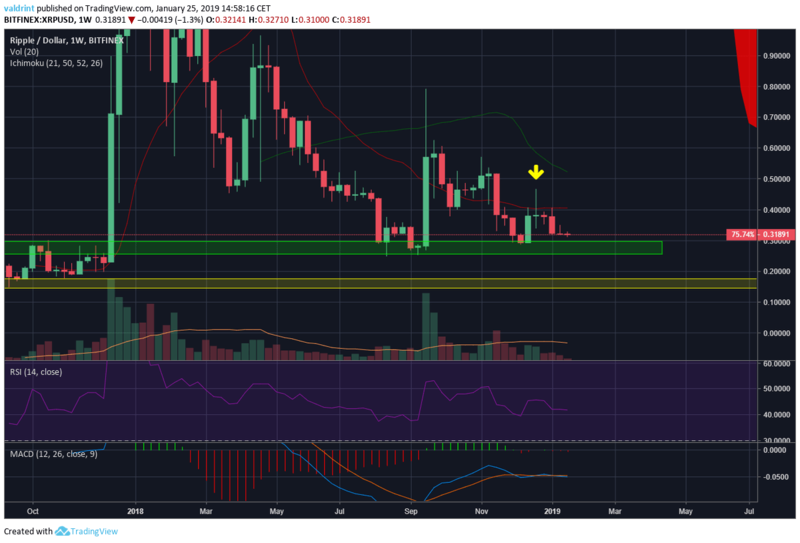 A look at the Weekly chart for XRP shows that price is very close to the major support area at $0.30. 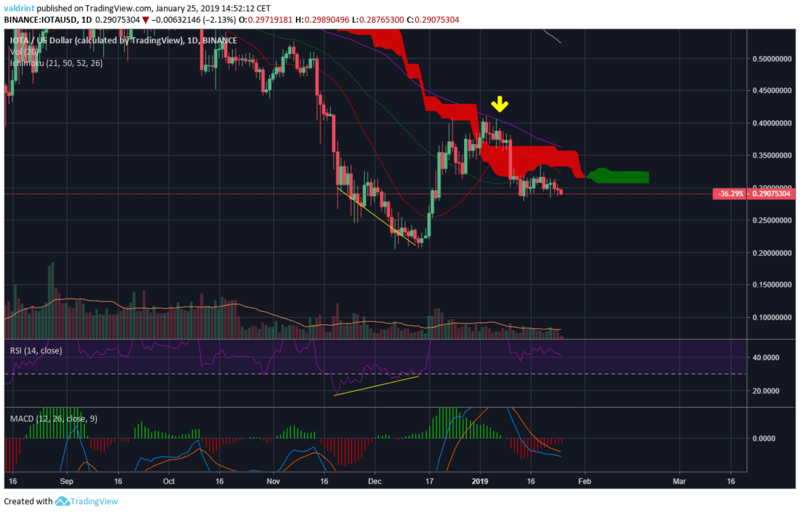 Price tried to break from the resistance offered by the 7-period MA during the last week of 2019 but was immediately pushed back resulting in a Doji candle (yellow arrow). There has been virtually no movement in the MACD for 8 weeks. 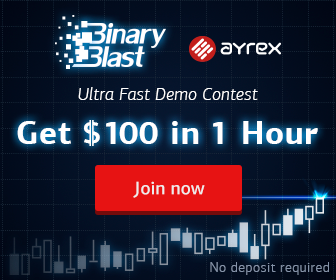 Currently the price is trading at $0.31. If the $0.3 support area fails to support price, the next one will be found at $0.16-$0.18. 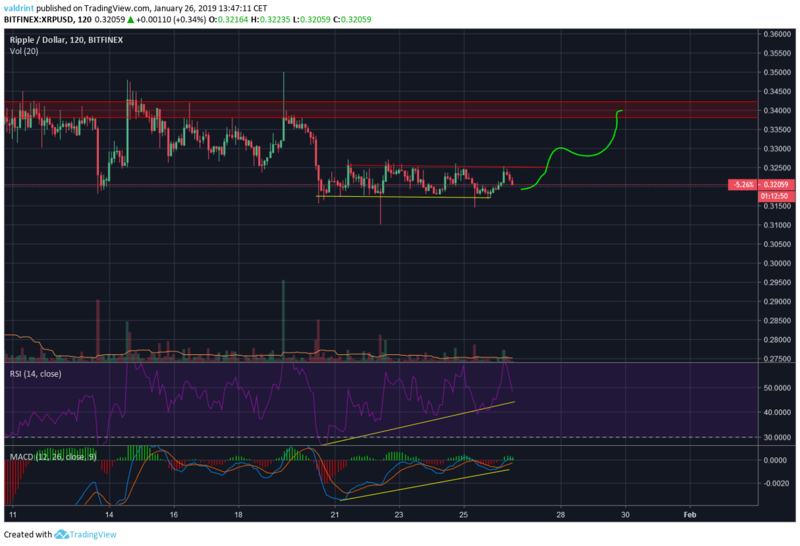 A look at the 2-hour chart for XRP gives more information about where price might be headed. We can see that price tried to break the $0.325 level multiple times but got pushed back every time. However, the price is creating significant bullish divergence in both the RSI and the MACD. A look at the Weekly chart for Stellar in logarithmic form shows that price is currently trading at $0.1, finding support at the 200-period moving average. Price is very close to the $0.7 support area formed by the highs of 2017. Price is currently trading below the 7, 21 and 50-period moving averages and the Ichimoku cloud. 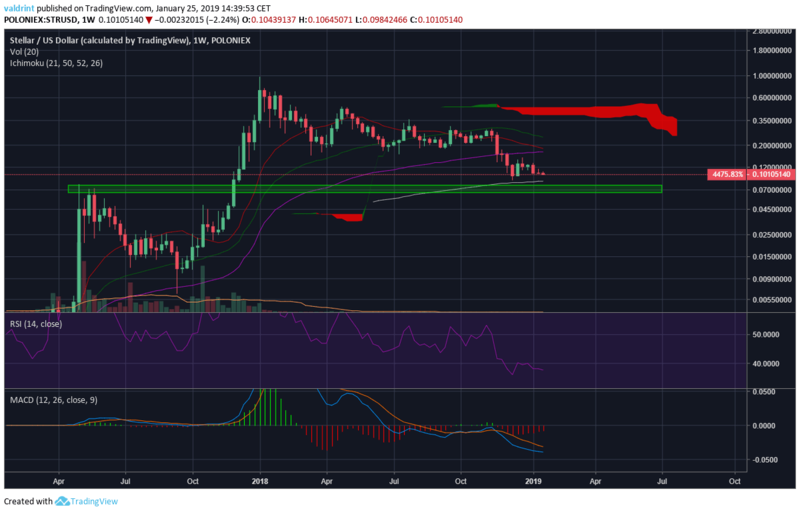 The MACD is falling but losing its power, and seems likely to make a bullish cross. A look at the 4-hour chart for Stellar gives more information about where price might be heading. We can see that after a long period of developing bullish divergence, price broke out of a descending wedge and a small retracement ensued. 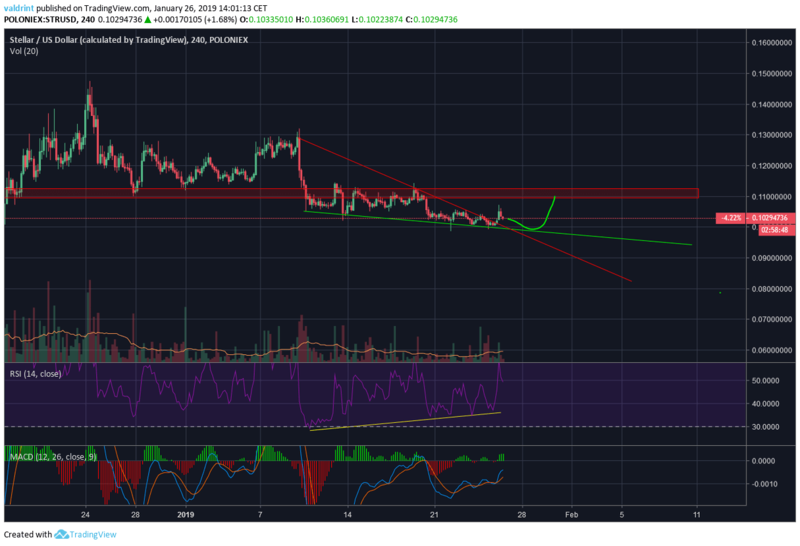 Price Prediction: I believe that during the next week price will head for the resistance at $0.11, after possibly validating the resistance line. 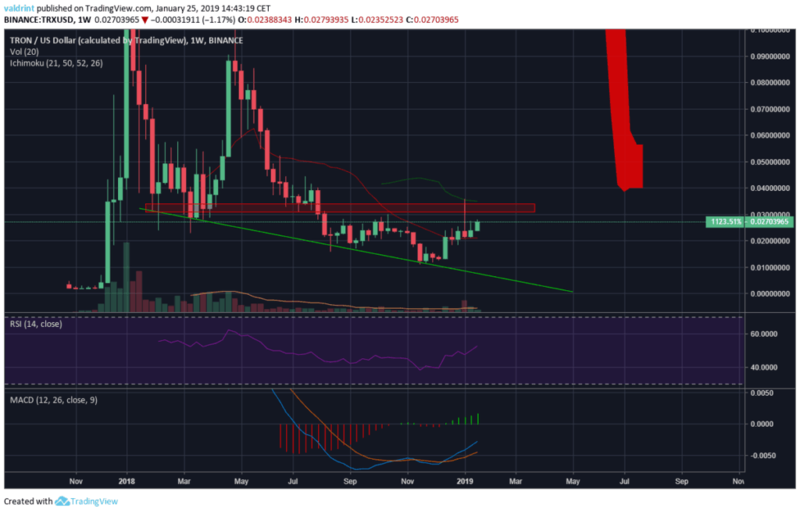 A look at the Weekly chart for TRX shows that price has moved past the 7-period moving average and is now headed for the $0.033 resistance area which coincides with the 21-period MA. Furthermore, the MACD is moving upward with strength and has almost turned positive. A look at the 6-hour chart for TRX shows that price is moving up while following a steady support line. There is no bearish divergence in the RSI nor MACD, and both are moving up. 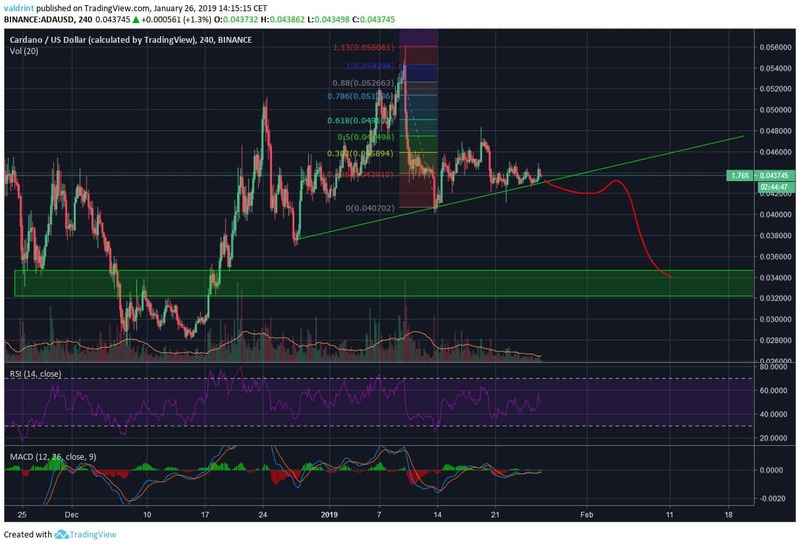 Price Prediction: Given this information, I believe during the next week price will head to the $0.32 resistance after possible retracing to the support line. A look at the 3-day chart for ADA shows that price has just moved past the 7-period MA and is trading at $0.043. Price is still below the 21,50,200 period MA and the Ichimoku Cloud. The MACD is going up but is not yet positive, and it seems to be losing power. A look at the 4-hour chart for ADA shows that after the drop from $0.54, price failed to break the 0.5 fib level and fell back to the support line. There is no bullish or bearish divergence developing. 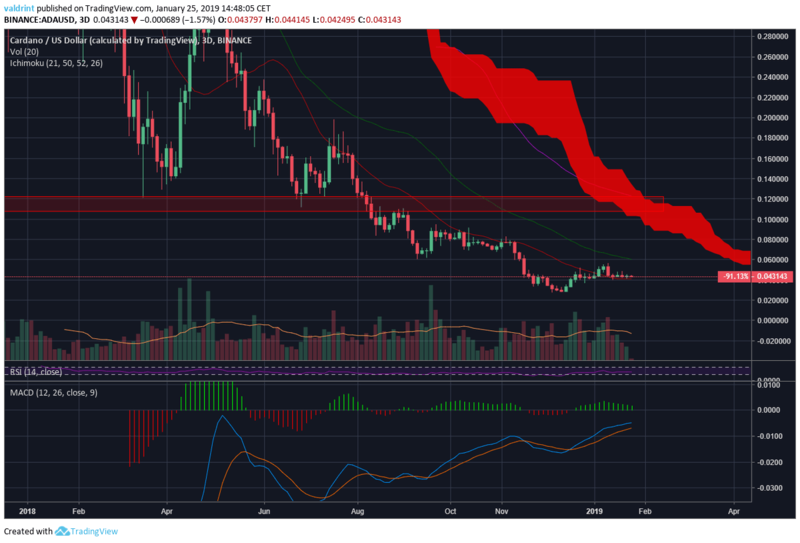 A look at the daily chart for IOTA shows that after a period of sustained bullish divergence, the price made an attempt to break out of the resistance provided by the Ichimoku Cloud and the 50-period MA at $0.4 but was promptly turned back. The MACD is flattening and is almost ready to make a bullish cross. A look at the 4-hour chart for IOTA shows that price is at the small support area of $0.27-$0.29. 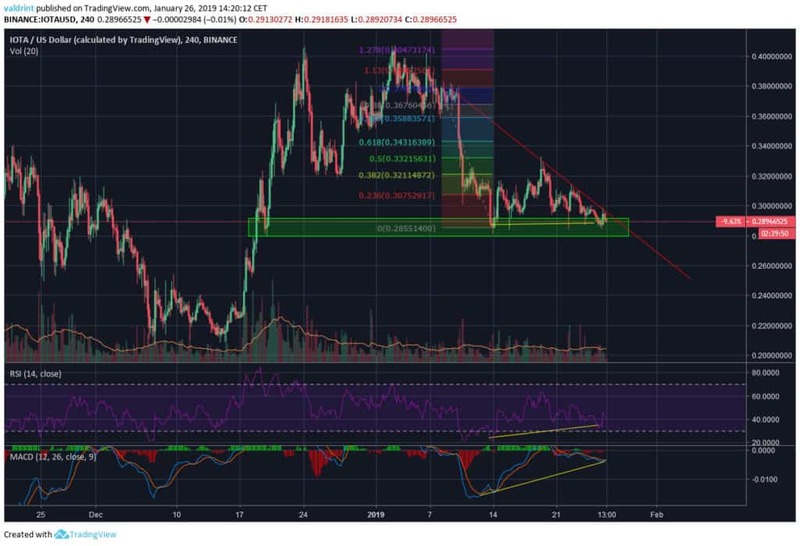 There is significant bullish divergence developing in the RSI and the MACD. 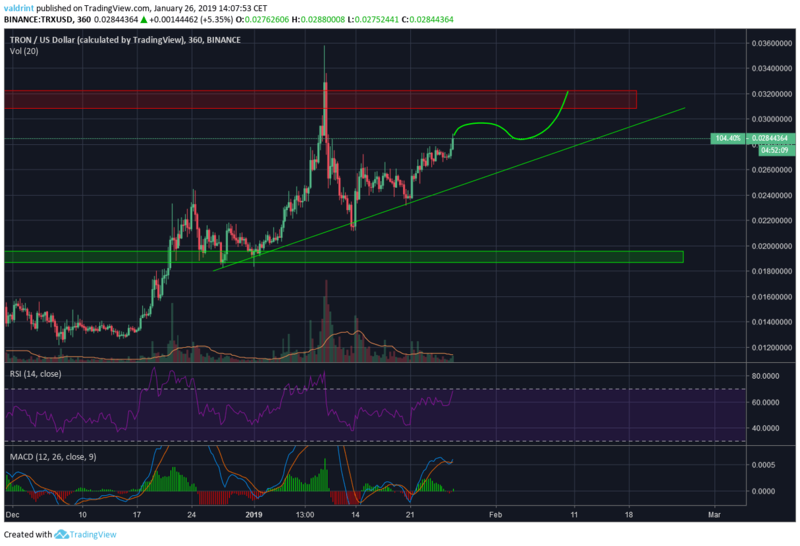 Price Prediction: I believe that during the next week price will break out of the red resistance line and head for the fib resistances of $0.33 and 0.358 respectively. 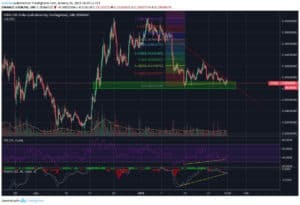 After analyzing the price charts thoroughly I believe that the two biggest risers this week will be TRX and IOTA. Price Predictions for the Top 5 Penny Cryptocurrencies: XRP, XLM, TRX, ADA & IOTA was originally found on copy trading cryptocurrency | Blockchain News | Bitcoin News | blokt.com.